To prepare marinade, mince the garlic and place in a bowl. Add the vinegar, soy sauce, fish sauce and bay leaves, stirring to combine. Add the pork, turning to coat all sides, cover and marinate in the refrigerator for 3 to 4 hours. Remove the pork from the marinade and drain, reserving the marinade liquid.Heat the oil in a heavy, 4-quart saucepan over moderate heat. when the oil is hot, add the pork and saute until well browned. Meanwhile, slice the onion thinly. Add to the pan and saute for 5 or 6 minutes or until translucent and soft. Add the reserved marinade and the chicken broth. Reduce heat, cover and simmer for 18 to 20 minutes. Remove the pork and transfer to a warm oven. Skim off and discard any surface fat and place the pan over moderate heat. Cook for 5 to 8 minutes or until sauce has thickened and reduced to one-half. Return the pork to the sauce, stirring to combine. The adobo is now ready to serve. For a special presentation, lightly oil a round gelatin mold, fill the ring with the steamed rice (seasoned with 2 tablespoons black sesame seeds) and pack firmly,. 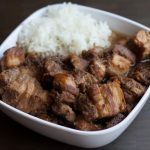 Un-mold the rice onto the center of a warm platter and ladle the pork adobo into the center of the ring.